AMSTERDAM, The Netherlands –Situated at the MediArena in Amsterdam, the new Endemol Sport studios have been equipped with two 42-fader HARMAN Studer Vista 5 digital mixing consoles as part of an innovative production design, involving three studios and three galleries on the same fiber backbone. The consoles were supplied by Heynen, Studer’s Dutch distributors, and installed by system integrator DutchView. These form the audio control of a sophisticated fit-out initiated by Eredivisie Media & Marketing to mark the start of the 2013-2014 Dutch football season. 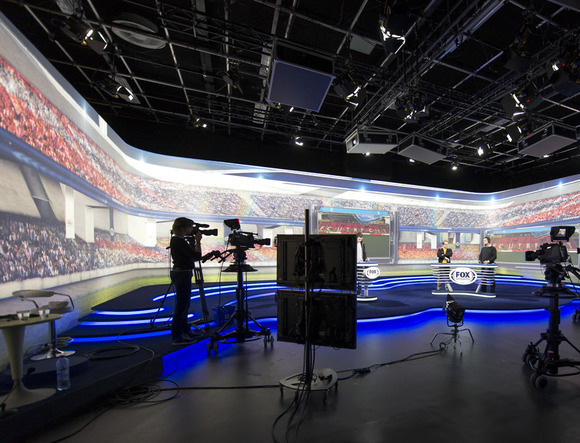 Three new HD studios and production galleries, dedicated to match-day programming and highlights, have been built and equipped for this purpose. The project’s primary objectives were to improve both the quality of content contribution across multiple platforms and the overall experience for viewers tuning in to the Fox Sports Eredivisie football pay-TV channels. Undertaking the conceptual design and specification was a team comprising Victor Winkelhage (head of production Endemol Sport), Jinne Tania (consultant Fox/Eredivisie) and SjaakVreeburg (Resources Manager Endemol). It was Vreeburg who produced the tender document, and later acted as project manager for the construction of the studios. The aim was to achieve an innovative mix of cutting-edge studio technology and IP-based platforms, with direct access from, and full integration between, technology and editing using Riedel MediorNet media networking. Although DutchView has historically been the house supplier for Endemol, and supplied the facilities for the Eredivisies Studio (Dutch Premier League League channel) it nevertheless had to participate in a 3-way tender process. Having nominated DutchView, Endemol and Fox then addressed the configuration details—namely to build three complete new studios (designated 4, 5, and 6) each with four cameras and LED lighting, while Studio 5 and 6 each have six projectors for background projection in the set. The two Vista 5 consoles will mix programs in Studio 5 and 6, alongside Grass Valley vision mixers, Vizrt studio and match graphics. Each Vista 5 is equipped with the SCore Live processor and accompanied by a 6U 19” Input Output Frame, with a Studer D21m 3U I/O Frame, each frame equipped with redundant power supply. This is populated with five SCore Live DSP boards; SCore Live Bridge board; Sync Generator board; GPIO Board; 12 Mic/Line inputs; 16 analog Line inputs; 24 analog Line outputs, eight digital AES/EBU inputs (stereo); eight digital AES/EBU outputs (stereo); MADI I/O board; threeMADI input/output board (Hub) optical with single mode fiber I/O; two HD board for link to DSP core; two 19'' 1U Fan units and two 19'' 1U air deflection panels; two19'' 1U air deflection panels with cable feed-through; Serial Merger Card; Vista 5 System Software; and Configuration Editor software. All the signals coming from the venues, the master control room and local play out servers are merged into MADI streams via a third-party audio router. Local studio audio sources (such as mics) are patchable directly to the Studer D21 I/O frame. The configuration was undertaken by DutchView, whose senior engineers also provided operational training, while Heynen commissioned the systems. In addition, the systems integrator also provides two OB vans for covering four soccer matches during a weekend—both equipped with Vista consoles and D21 routing systems. Netherlands-based television and digital production company Endemol is the world’s largest independent television and digital production company. Fox Sports Eredivisie is a Dutch premium television service owned by Eredivisie Media & Marketing CV, which in turn is held by Fox International Channels (51%), the Eredivisie CV Football clubs, Endemol and the KNVB (Dutch FA).